There’s something about the joy of finding a letter in the mailbox or the simple pleasure of reading a handwritten note that I find incredibly satisfying. As much as I rely on email and my Blackberry, nothing beats receiving a real letter, the old-fashioned way. This holiday, I’m determined to pass on that feeling. I usually say that I’m too busy (procrastinating) or not crafty enough to make the “perfect” card, but my friend’s Christmas card this year encouraged me to get in the spirit. So I turned to the queen of creative (and my secret hero! 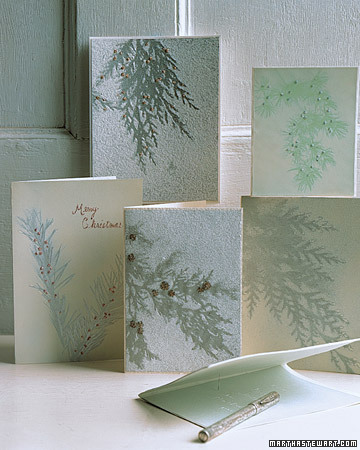 ), Martha Stewart, for some inspiration (her latest holiday issue is amazing!). How cool are these cards? Powdery blues, pale greens and silvery-whites with subtle sparkle never fail to evoke the whimsy of a winter wonderland. They make elegant and understated cards. I like that they aren’t necessarily holiday-specific, so they can be given widely without offense. 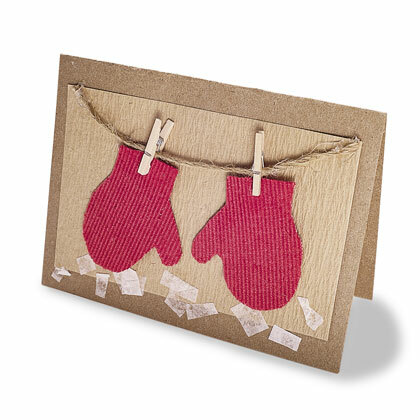 For the ambitious, there are these cute pop-up cards. As cool as they are, I think I’m going to stick with basic cut and paste this year! 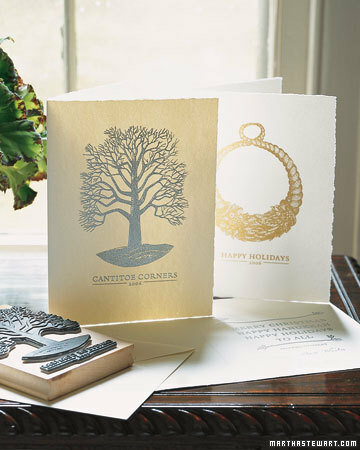 Even better are these beautiful embossed cards — metallic print on nice, thick card stock. I love the combination of visual and tactile appeal. It’s definitely not a prerequisite to personally hand-make your card for it to be memorable or special. I think a simple, personal letter makes a great surprise for the receiver since most mail now are bills and ads. For example, my friend Eileen sent me a bright orange card for Halloween this year. Just seeing that little pop of orange amid piles of mail cheered me up so much. So, drop someone a line — it’s actually kind of fun! As for myself, I’m deciding on a felt gingerbread man or clothes-pinned red stocking. 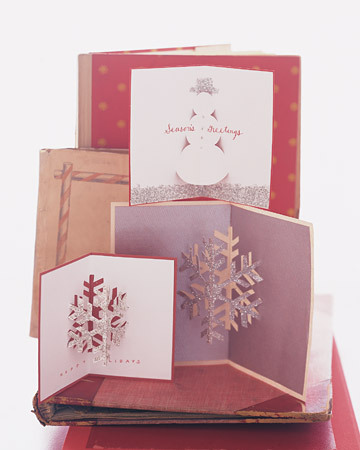 I’m also thinking maybe a “Baby, it’s cold outside” greeting with sparkly snow for a playful winter theme. I’ll feature them this week, so stay tuned! I thought letter writing had become a “little old fashioned” also; but I’ve found lots of people who still thoroughly enjoy the “pasttime”! Hope you’re mailbox is full of letters this year! Thank you! I really appreciate your comment :) I just finished mailing this year’s batch of letters and I loved every minute of handcrafting the cards and writing down my well-wishes. I enjoy your blog and have been following since your comment last year. I love that you listed God as one of your letter’s addressees. Reminds me of when I used to write my prayers/wishes/hopes/thoughts to Him and keep them in a special box. Though email makes keeping in touch much more convenient, there truly is nothing like a great hand-written letter. Happy Holidays to you and your family and I hope your mailbox is full of letters this year as well! I know each and every one of your recipients cherished receiving your special letter in the mail.